Babel Rising was developed by Mando Productions and published by Ubisoft. It was released June 13, 2012 for 800 MSP. A copy was provided for review purposes. We’ve all been there. You move into a nice area with a great view and some jumped up Babylonian builds a ruddy big tower…well maybe not. 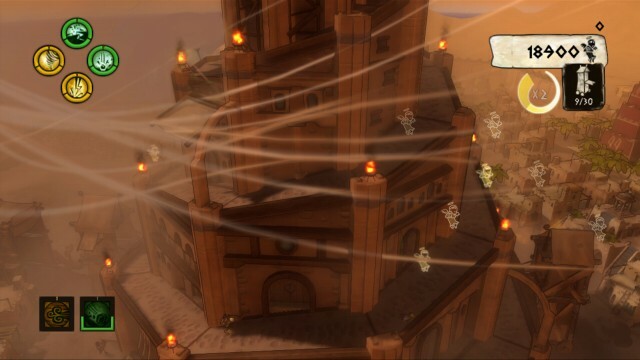 Babel Rising is the latest Kinect centric game released on XBLA. The game aims to give players the “hands of god” to smite tiny Babylonians who persist in building a large tower. Players utilize the elements of fire, water, earth and air to create bolts of lightning and gigantic floods that reign down punishment. The game plays out much like your standard Tower Defense affair, except here we’re trying to halt the creation of a tower rather than the destruction of one. The motion controls are designed to give players a unique sense of power, but does flapping your arms around in your front room yelling “ultimate power” really provide a god-like experience? Heavenly graphics – It may be a port of a mobile phone game but the upgraded visuals translate well and the graphics look stunning on an HDTV. It’s nice, bright and highly detailed. We’ve all seen the screenshots but they really are impressive on the big screen. The overall presentation is let down only by some very plain brown menus. Controller of God – Despite being marketed as a Kinect game on XBLA, Babel Rising can actually be played in its entirety with a regular 360 controller. Bafflingly the first clue to this is finding out that the (offline only) multiplayer mode can only be unlocked when starting the game with a 360 controller. The regular controller works well with the camera being controlled by left stick and the crosshair with the right stick, and each power is mapped to one of the colored buttons. Gameplay here seems to run a little faster, presumably because using a physical controller makes the game much easier, though watch out for the early difficulty jump. Unfortunately, controls can’t be switched from within the game, you must quite to dashboard then load up the game using the controller that you want to play with. The hand of Kinect – Someone out there seems to be pushing Babel Rising as a Kinect game but quite frankly, these are some of the least responsive Kinect controls in any game we’ve come across so far. Firstly voice controls do not work. Period. We tried using all sorts of accents, pitch, volume but nada. Voice controls work fine on the Xbox dashboard, so we’ve got to put the blame squarely on Mando here. Luckily you don’t need to use the voice controls as there are also gestures that be used to launch the same actions. Well, we say luckily but it seems that there’s only around a 30% chance at a clap will result in a change of powers and depending on how straight your arm is, apparently, the flapping gestures will only launch an attack half of the time. It’s also really difficult to control the camera with any sort of precision and we’ve found that once you have it set during a level it’s best to leave well enough alone for danger of the camera swinging into an endless spiral mid game. Of course this means you have no idea what is happening at the other side of the tower. The word of Mando – Helpful screen tips frequently pop up with advice such as “Keep your arm straight” (which arm? ), unfortunately these appear right slap bang in the middle of the screen obscuring your view of the game. The action continues on behind said messages, which don’t disappear until you figure out which arm is not quite straight enough, often resulting in greatly reduced performance. Forty days and forty nights? – The length of a game is often critical for gamers in deciding whether to part with those hard earned MSPs. Babel Rising is bundled with 15 levels which seems fair enough, however each level lasts around 10-20 minutes. For a Kinect game which sees you standing still with your arms (straight!) out and flapping them every few seconds for up to 20 minutes, this is practically torture. Even if you opt for use of the regular 360 controller, bashing the same wee people with the same powers, up the same tower gets old fast. After around 5 minutes you’ll be clock watching and thinking “What do you mean there’s another 30 waves to go?”. There are other modes included, designed to extend the life of the game after campaign, such as the endless survival mode. However the 20 minute campaign levels are torture enough and the thought of playing the game endlessly using Kinect sounds like some sort of horrendous biblical test, though perhaps that’s the point? Multiplayer is strictly offline and we could go into the usual moan about that, but instead we’ll question why a Kinect game includes a multiplayer section that can’t actually be played using Kinect? To be fair though, given the poor single player recognition, we can’t image what kind of hell on earth a two player Kinect mode might offer. If you were looking for a nice new Kinect title to add to your library then we’re sorry to say that Babel Rising’s Kinect gameplay doesn’t work. On the few occasions that gestures are recognized, the controls are so finicky that the game just far too frustrating, tiring and simply not fun. As a controller based game, Babel Rising fairs better, however levels are too long and samey that players are likely to get bored fast. There’s no music in the game just repetitive drums and chanting and these only add to overall yawn factor. Babel Rising might cut it as a mobile phone game but on XBLA, its priced at 800 MSP probably because of the inclusion of motion controls. However since we’d recommend you forget about the Kinect part of Babel Rising and play the game with a regular controller, we’d suggest waiting for the inevitable price drop. Or better yet just skip it altogether, for there are much better Tower Defense games on XBLA already.